Messier 2 (M2) is a globular cluster located at an approximate distance of 37,500 light years from Earth, well beyond the galactic centre. The cluster lies in the direction of Aquarius constellation. It is one of the largest known clusters of its kind in the night sky, spanning about 175 light years in diameter. The cluster has the designation NGC 7089 in the New General Catalogue. Messier 2 has an apparent magnitude of 6.3 and is located five degrees north of the bright star Beta Aquarii, which is also known by its traditional name, Sadalsuud. 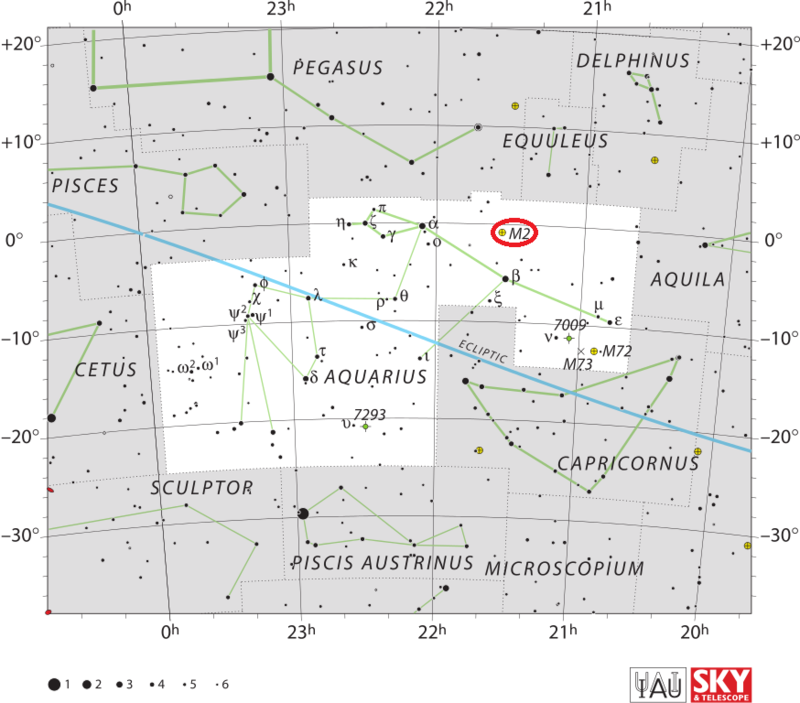 With an apparent magnitude of 2.87, Sadalsuud is the brightest star in Aquarius. M2 is on the same declination as Alpha Aquarii, the constellation’s second brightest star. Alpha Aquarii, also known as Sadalmelik, lies 10 degrees northeast of cluster. Sadalsuud, Sadalmelik and Messier 2 form a large right-angled triangle. 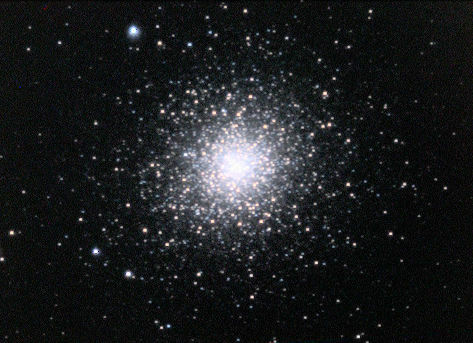 Messier 2 is among the older globular clusters associated with the Milky Way. The cluster’s estimated age is 13 billion years, roughly the same as the age of the globular clusters Messier 3 and Messier 5, located in the constellations Canes Venatici and Serpens respectively. The Universe is estimated to be 13.8 billion years old, which means that the cluster likely formed when the Universe was only 6 percent of its current age, less than a billion years old. M2 is moving toward us at about 5.3 kilometres per second. The cluster orbits in the halo of the Milky Way and contains some of our galaxy’s oldest known stars. As the stars are much older than the Sun, they have few elements heavier than hydrogen and helium, which makes the existence of Earth-like planets highly unlikely in the cluster. M2’s tidal influence is significantly larger than its diameter and reaches about 233 light-years. This is the point beyond which member stars could escape the cluster because of the tidal gravitational forces from the Milky Way. 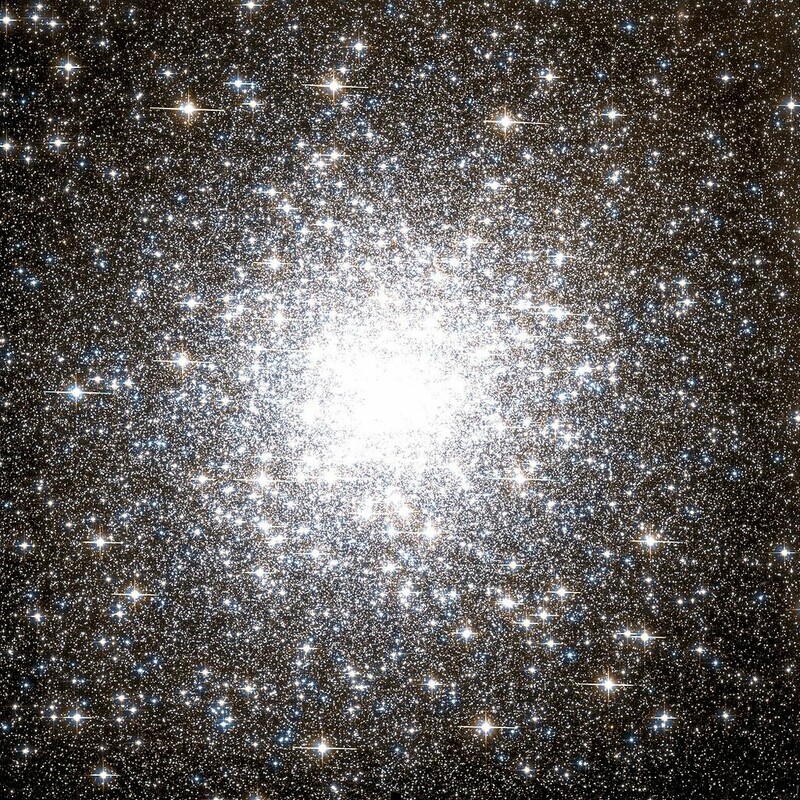 Messier 2 is dense and compact, containing approximately 150,000 stars within a diameter of 150 light years. The dense central region of M2 is only 0.34 arc minutes across, corresponding to a diameter of 3.7 light years. The cluster has one of the densest cores and belongs to the density class II on a scale of I to XII, with XII reserved for clusters that are the most diffuse at the core. 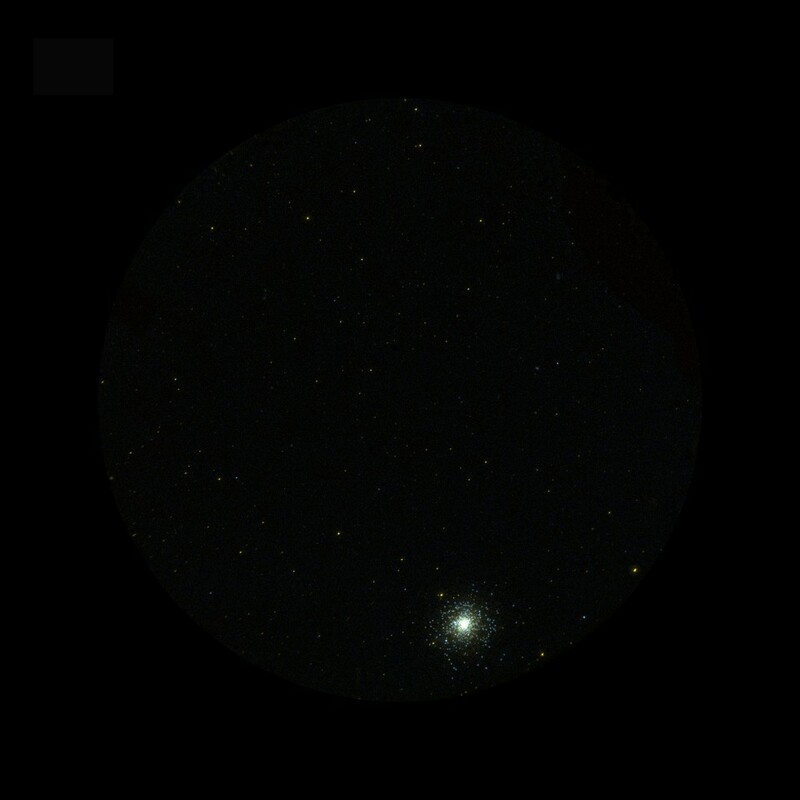 The brightest stars in M2 are of magnitude 13.1 and mostly yellow and red giants. The cluster’s overall spectral class is F4. 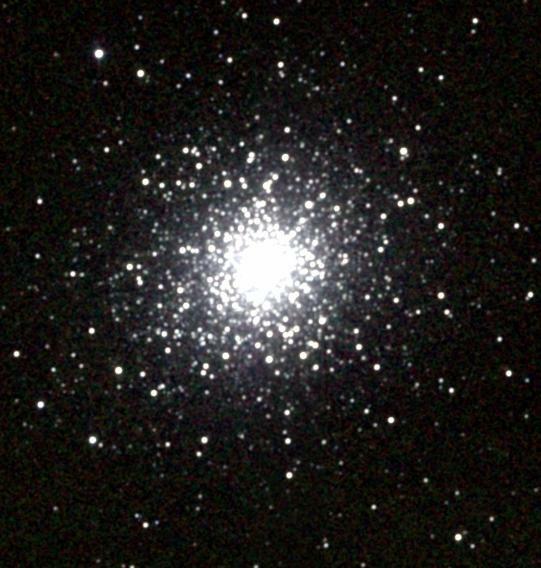 Messier 2 has an elliptical shape. It is home to 21 known variable stars . These are mostly RR Lyrae variables, pulsating variable stars belonging to the spectral class A (or F), typically half as massive as the Sun, and commonly found in globular clusters. RR Lyrae variables are often used as standard candles to measure galactic distances. Three Cepheid variables have also been identified in the cluster. Cepheids are luminous variable stars that also serve as indicators of galactic distance scales. These stars vary between a larger, brighter state and a smaller, denser one. Cepheids were named after Delta Cephei in Cepheus constellation, the first variable star of this type to be identified. One of the variable stars found in M2 is an RV Tauri variable, a luminous pulsating variable that exhibits changes in luminosity and spectral type over a 69.09 day period. The star is located at the eastern edge of M2. Messier 2 was discovered by the Italian-born French astronomer Jean-Dominique Maraldi on September 11, 1746. Maraldi discovered the object while observing a comet with the French astronomer Jacques Cassini, the son of the famous Italian astronomer Giovanni Cassini. Charles Messier spotted the cluster on September 11, 1760 – exactly 14 years after Maraldi’s discovery – and thought it was a nebula without any stars associated with it. 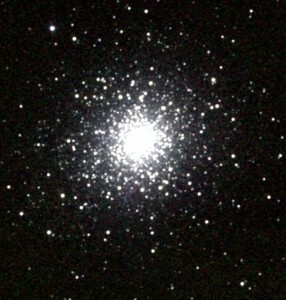 Messier 2 was the first globular cluster to be included in Messier’s catalogue. The German-British astronomer William Herschel was the first to resolve individual stars in M2, in 1783. With an apparent magnitude of 6.3, Messier 2 is just at the edge of naked eye visibility, but requires extremely good viewing conditions, with clear skies and no light pollution. The best time of year to observe the cluster is between the months of July and October. The globular cluster can be observed in binoculars and small telescopes, but individual stars can only be seen in larger instruments, starting with 6-inch telescopes. A peculiar dark lane can be seen crossing the northeast edge of the cluster in larger telescopes. Larger instruments are required to resolve the stars because the cluster is very far away and the stars in it are old, so only the rare stars similar to the Sun and the occasional blue straggler are visible. Blue stragglers are main sequence stars found in clusters, that appear bluer and more luminous than stars at the main sequence turn-off point for the cluster. American astronomer Allan Sandage discovered these stars in 1953 while studying the stellar population of the globular cluster Messier 3.